Celebrity interview, Like magazine, September 2015. Click to enlarge. Read below. 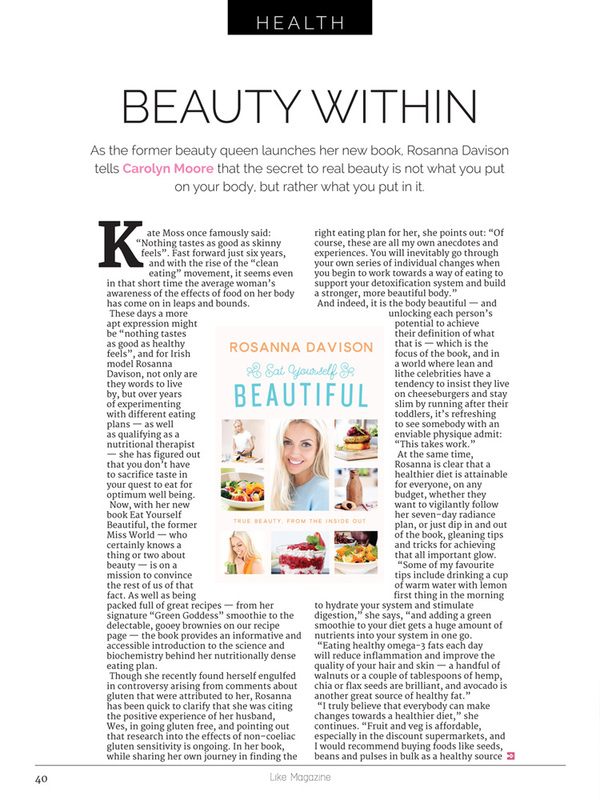 As the former beauty queen launches her new book, Rosanna Davison tells Carolyn Moore that the secret to real beauty is not what you put on your body, but rather what you put in it. Kate Moss once famously said: “Nothing tastes as good as skinny feels”. Fast forward just six years, and with the rise of the “clean eating” movement, it seems even in that short time the average woman’s awareness of the effects of food on her body has come on in leaps and bounds. These days a more apt expression might be “nothing tastes as good as healthy feels”, and for Irish model Rosanna Davison, not only are they words to live by, but over years of experimenting with different eating plans — as well as qualifying as a nutritional therapist — she has figured out that you don’t have to sacrifice taste in your quest to eat for optimum well being. Now, with her new book Eat Yourself Beautiful, the former Miss World — who certainly knows a thing or two about beauty — is on a mission to convince the rest of us of that fact. As well as being packed full of great recipes — from her signature “Green Goddess” smoothie to the delectable, gooey brownies on our recipe page — the book provides an informative and accessible introduction to the science and biochemistry behind her nutritionally dense eating plan. At the same time, Rosanna is clear that a healthier diet is attainable for everyone, on any budget, whether they want to vigilantly follow her seven–day radiance plan, or just dip in and out of the book, gleaning tips and tricks for achieving that all important glow. 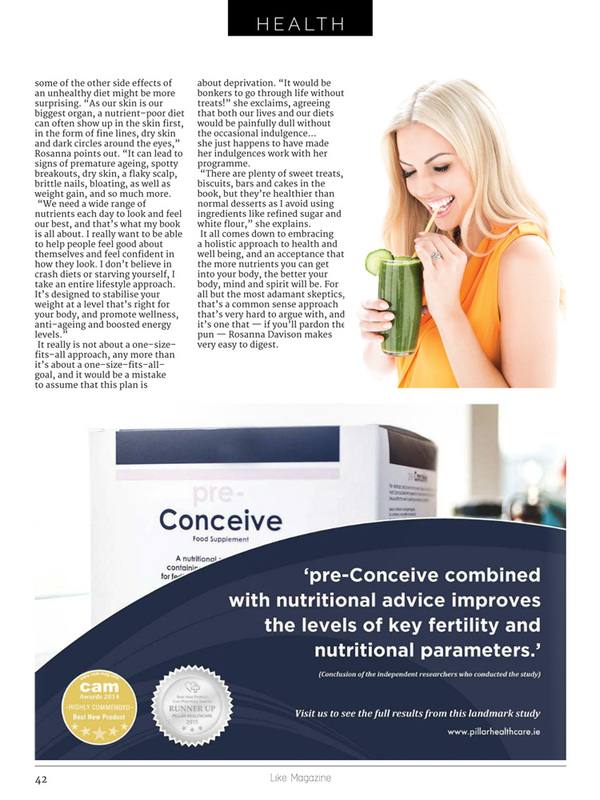 “Some of my favourite tips include drinking a cup of warm water with lemon first thing in the morning to hydrate your system and stimulate digestion,” she says, “and adding a green smoothie to your diet gets a huge amount of nutrients into your system in one go. As a strict adherent to a plant–based diet, it’s not surprising that the recipes Rosanna has developed for her programme are free of animal proteins. While she made an ethical decision as a child to become vegetarian, it was primarily for health reasons that she transitioned to veganism, explaining: “I love the huge range of health benefits to being plant–based. My energy levels are so much higher, I sleep better, my immune system is stronger and my weight stays stable.” But this is no conversion mission. “All the recipes in the book are plant–based, but it’s not about trying to make people convert to that. 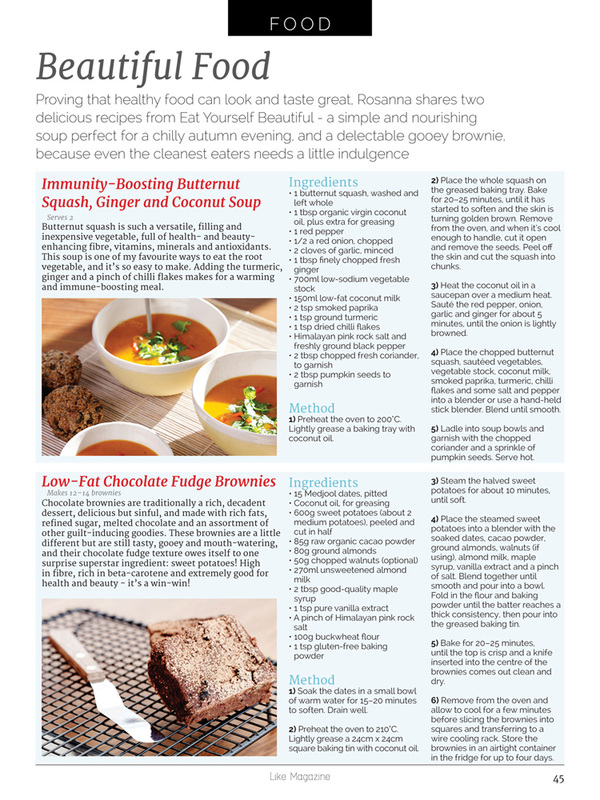 My aim is to present a wide range of nutrient–dense foods, with plenty of practical health and beauty tips. Readers can dip in and out, and even adding a smoothie or a salad each day can make a great difference to overall health. And for Rosanna there is no going back. “I’ve made my fair share of mistakes on the way to realising what works best for my body,” she acknowledges. “The eating plan I advocate now is about reducing inflammation and balancing and healing the body. In the past I’ve had struggles with acne breakouts, bloating, sugar addiction and weight gain, and being vigilant about the type of food I eat has been key. And while most women would be conscious of their calorie intake, some of the other side effects of an unhealthy diet might be more surprising. “As our skin is our biggest organ, a nutrient–poor diet can often show up in the skin first, in the form of fine lines, dry skin and dark circles around the eyes,” Rosanna points out. “It can lead to signs of premature ageing, spotty breakouts, dry skin, a flaky scalp, brittle nails, bloating, as well as weight gain, and so much more. It really is not about a one–size–fits–all approach, any more than it’s about a one–size–fits–all–goal, and it would be a mistake to assume that this plan is about deprivation. “It would be bonkers to go through life without treats!” she exclaims, agreeing that both our lives and our diets would be painfully dull without the occasional indulgence… she just happens to have made her indulgences work with her programme. “There are plenty of sweet treats, biscuits, bars and cakes in the book, but they’re healthier than normal desserts as I avoid using ingredients like refined sugar and white flour,” she explains. It all comes down to embracing a holistic approach to health and well being, and an acceptance that the more nutrients you can get into your body, the better your body, mind and spirit will be. For all but the most adamant skeptics, that’s a common sense approach that’s very hard to argue with, and it’s one that — if you’ll pardon the pun — Rosanna Davison makes very easy to digest.